Support SLU teachers and Employees! No to Aquino’s K12 Program! The K 12 program can be considered “hinog sa pilit” since it has been piloted in 2013. Teachers themselves admit that they are “confused” as to how the government would want them to teach the new program, when there have been no extensive trainings provided. What differentiates the additional years in school under the K12, from the original years were not clearly defined, yet the government started its implementation. In addition to the inadequacy of the government to train teachers, it implemented a new program without addressing the lack of classrooms, textbooks, facilities and other materials needed. Thus, the K12 program’s additional years for schooling consequently made additional problems in the lack of the items stated above. One of the most troubling concern with the K12 program is that it created a two-year “vacuum starting school year 2016 that will result to more than 25,000 unemployment among the teaching and non-teaching personnel from schools nationwide due to the fact that there will be none or lesser incoming freshmen from 2016-2018. Saint Louis University will retrench more than 180 regular faculty members, in addition to the 400 contractual employees. 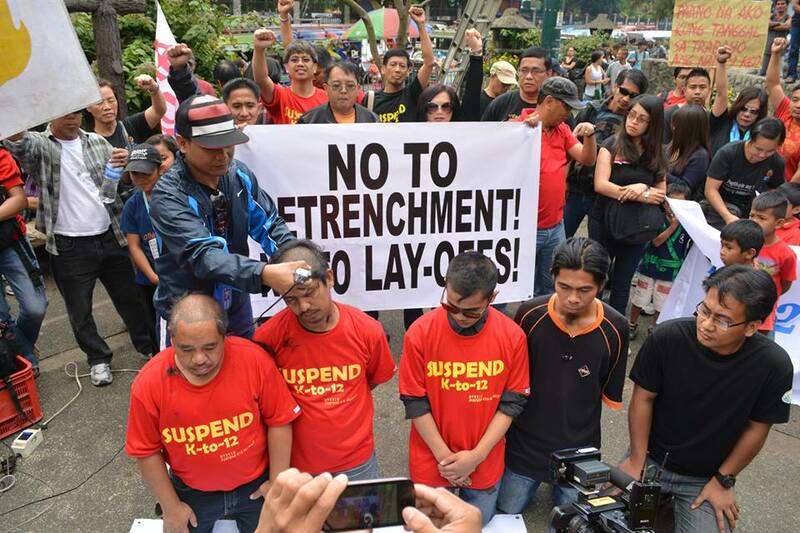 After recently commemorating May 1 as International Labor Day, the Aquino regime remains to be against the rights of our country’s workers by being persistent in implementing anti-people programs and policies. The K12 program of Aquino, which is followed by both public and private schools and universities, removes the rights of the workers to decent jobs, affecting the lives of their families as well. Uphold the True Filipino Heroes: Stop Historical Revisionism!